Did you ever have one of those moments where you just felt so foolish that you wanted to crawl under a rock? I had one just after submitting my entry for the Dear Stella/Timeless Treasures mini quilt challenge (just after my last blog post). They were kind enough to email me back almost immediately letting me know that my mini didn't meet the size requirement. Uh...what?! I had printed the guidelines out and had them with my pattern to make sure I was doing it "right". And yet there it was clear as day, right at the top: mini's much be 20"x20". Somehow that translated to mini's must be 20" or smaller to me. Clearly my mistake and I felt awful about it. And I figured that was it. I'm a slow sew-er and not that great at math to boot so I consoled myself with donuts and super kind words from the IG community. But then Caroline of Nightingale Quilts emailed me to say she'd happily figure the pattern out to be 20" if I wanted to try again. And I started thinking about how I keep telling my daughter that being frustrated and making mistakes aren't reasons to give up and I decided to take my own advice. It was also lucky that I started with half yard cuts of these fabrics - even after making my first mini I still had enough to make the second. So it seemed like the stars aligned and everything fell perfectly into place. I had no appointments or sick children. We had enough food in the house. The kiddos acted nice to each other and actually played together. I ignored every possible thing that I could. My husband took over bedtime so I could sew. It just worked out. 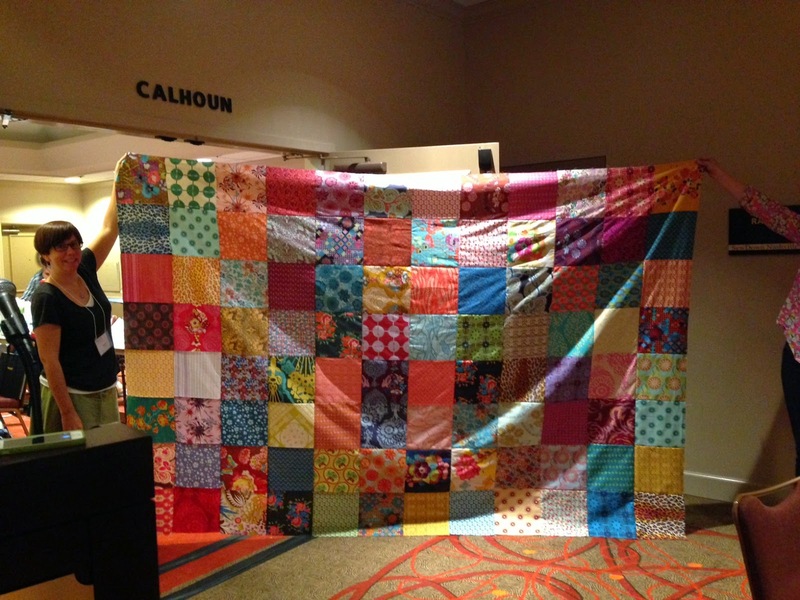 It feels like a quilting miracle happened here yesterday. So I have my 20"x20" mini to submit today and I am so happy. Mostly happy that I didn't give up. And thankful for friends and family who are so supportive. We have a project here in Atlanta called Living Walls and they paint these cool murals all over town in very, ah, urban areas that need beautification and I remembered seeing this blue wall on the way to the zoo and thinking it would be a cool background for a photo shoot. After I parked the car and walked into the parking lot I looked back across the lot and saw this - perhaps a bit strange in it's entirety but still quilty and cool. 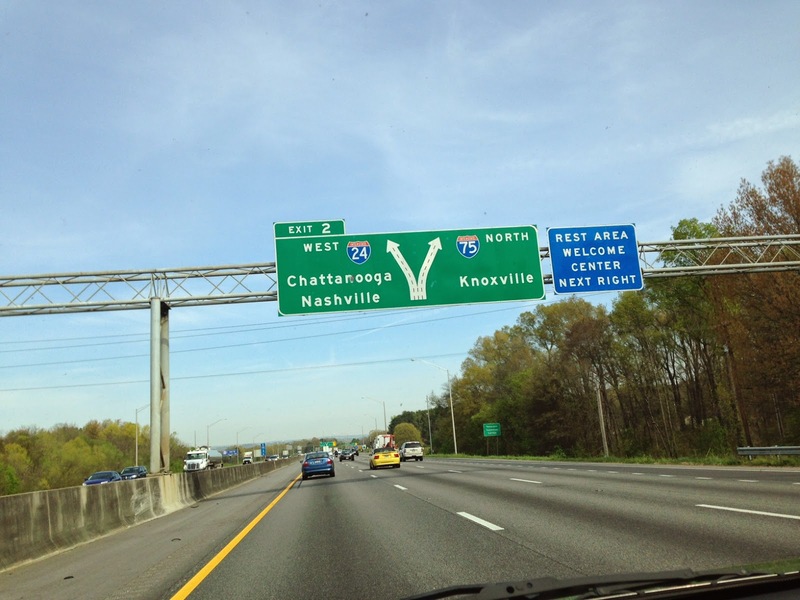 I had been missing it because I was always looking forwards on our drive and we usually go home another way. All it needed was the right framing and voila - the perfect quilt background. I couldn't believe my good luck. 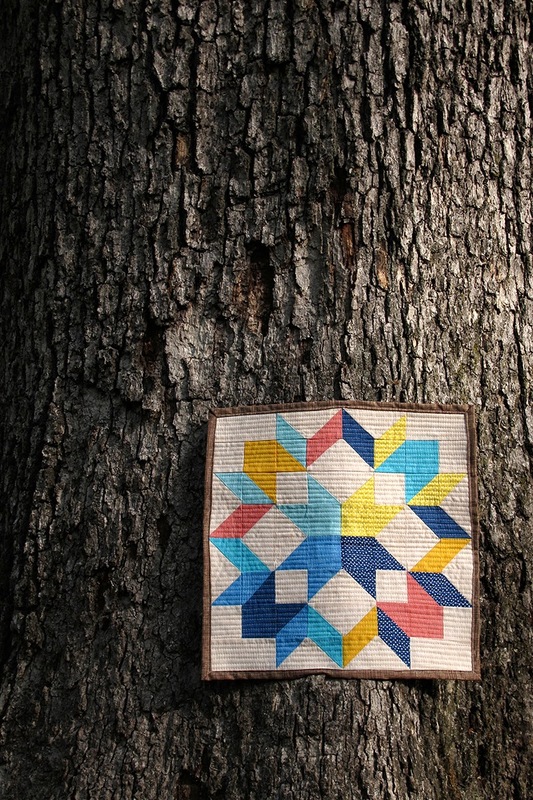 This is one of those rare cases where I love the photos as much as the actual quilt. My thoughts on the "modern traditional" theme of this challenge are the same as in my last post and I don't want to bore you by repeating myself. 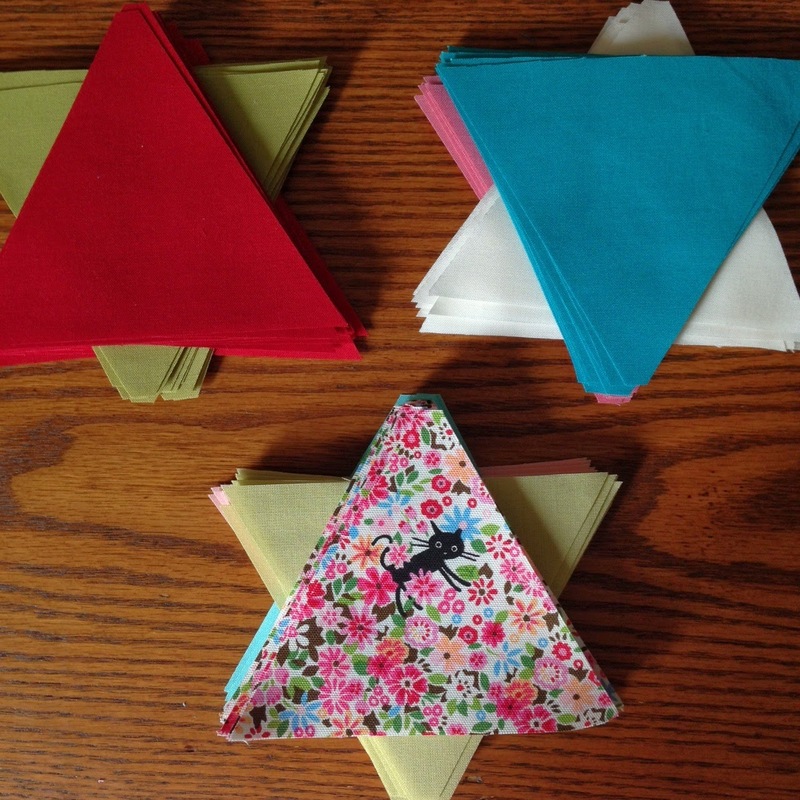 As I look at these are flying geese and HST blocks, I know they are nothing really new or particularly modern, I think the magic happens with Caroline's arrangement of them and my color choices. 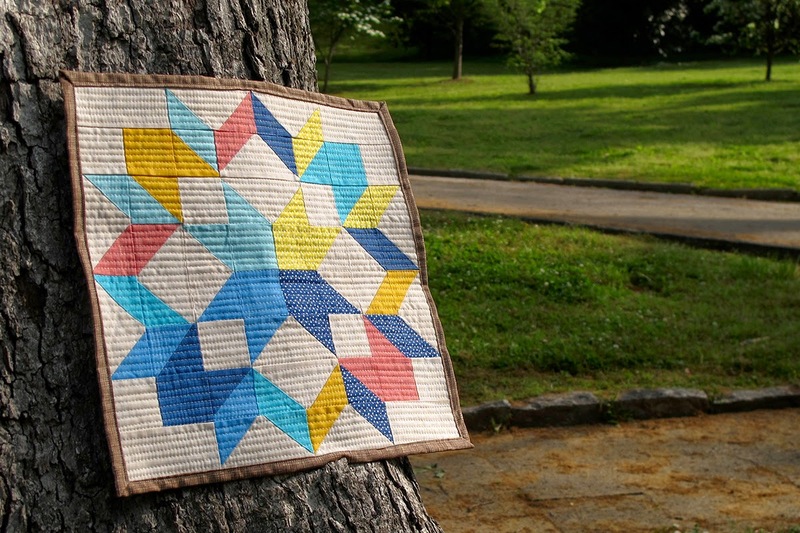 This design feels completely current and fresh to me while using some of the most common building blocks of quilting. Have I mentioned how much I love these fabrics? Tone-on-tone and blenders are where it's at in my book and you won't find better than Sketch by Timeless Treasures or these Confetti Dots from Dear Stella. Finally a little shot of my pieced back (more Sketch and Confetti Dots) and the matchstick quilting I did - I love how the dense quilting shows the pattern of where all the seams come together, making a kind of shadow of the back. Thanks again to Timeless Treasures and Dear Stella for hosting this challenge (which turned out to me a major challenge for me personally) that pushed me to do something I didn't think I could do and inspiring me to not give up. Seriously, thanks. Thanks as well to Caroline for her amazing math skills! This pattern is available in her Craftsy shop to make a 32" version (but if you ask nicely she might even share the measurements for the 20" version). Happy Friday everyone! We made it through another week and I kind of can't believe it but we only 4 weeks until summer vacation...time surely is flying around here. So I finished this to take to SewDown with me but I never shared it on the blog, so I figure this still counts towards a Friday Finish. I wanted something special since we were going to the studio tour at Anna Maria Horner's house but I don't really sew garments - not frequently enough to feel confident about it anyway. So I decided to stick with what I know and I made this bag that I've had bookmarked forever. Check out all that leopardy goodness on the inside - totally outside my normal wheelhouse but I had it on hand and I actually love it. Very excited to carry this as my new summer bag! Have a great weekend! See you back here next week. 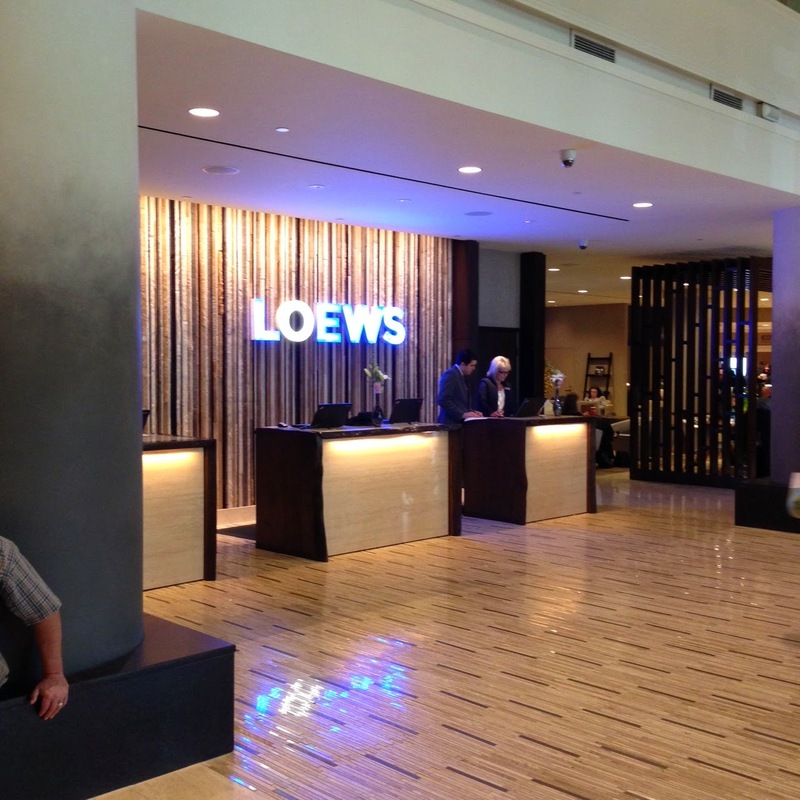 The even was held at the Loew's Vanderbilt Hotel, literally across the street from Vanderbilt University (which was gorgeous all abloom). The rooms were lovely and the conference space was ideal for classes and meals. All four teachers were A-list and did not disappoint. I felt like I learned something in every class and came home recharged and inspired. 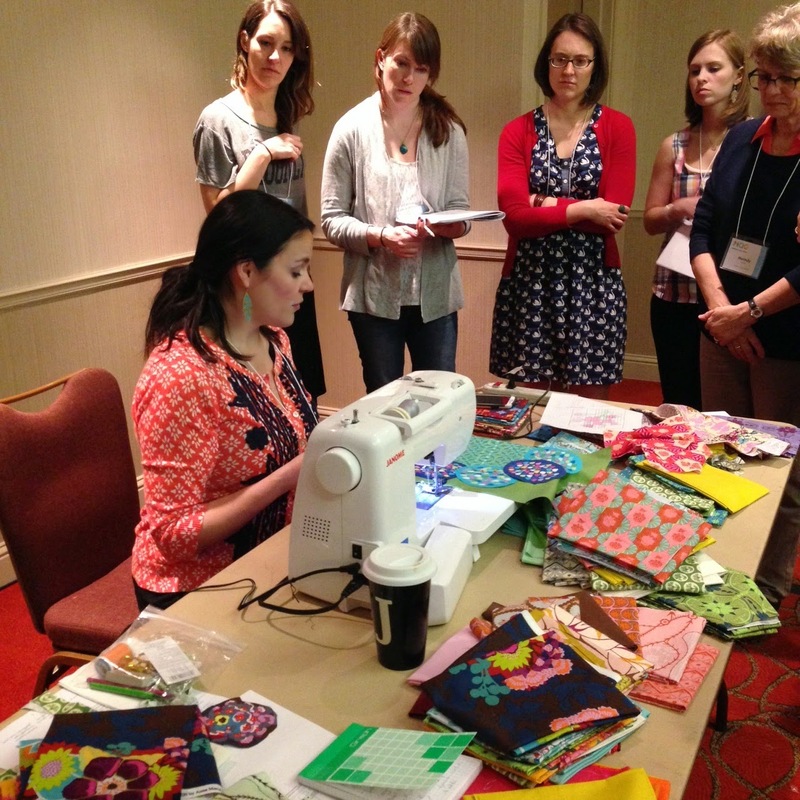 Anna Maria Horner's class was based on broderie perse applique (which I was completely unfamiliar with). Now to get my applique sewn down - seems like a great hand sewing project when we vacation this summer. I went a little off topic with mine but I was quite happy with it anyway. Victoria's book in case you'd like to try this technique at home, my mini dresden template from E-Z quilting (who gave us great goodie bags with mini templates and pins and thread cutter - came in very handy). Here's my mini dresden composed of my made fabric - I couldn't love it more! So excited to get this finished and turned into a great mini or pillow! 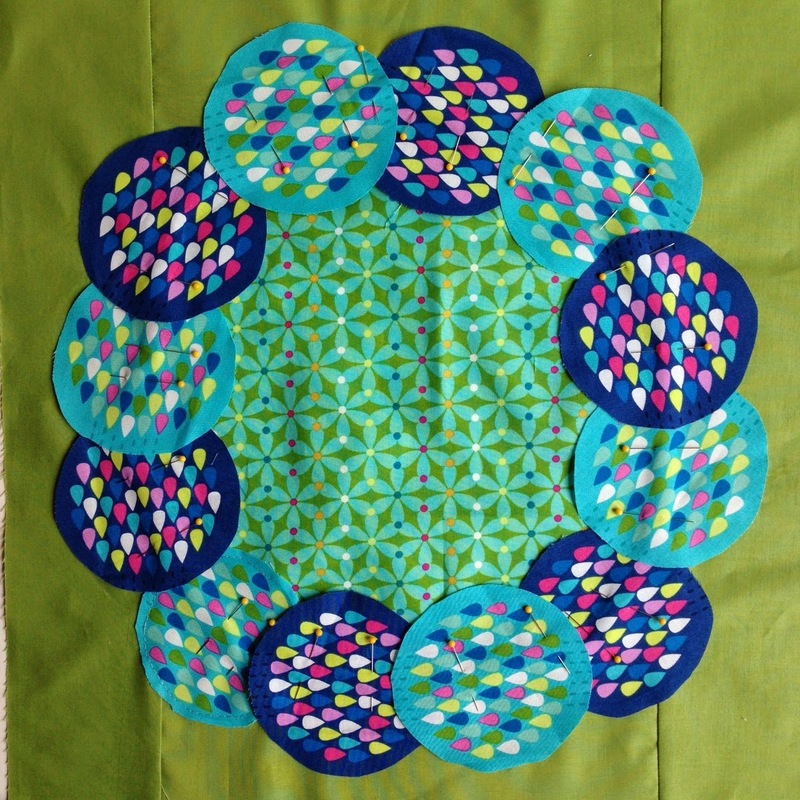 One of he other two teachers was Carolyn Friedlander, who taught us foundation paper piecing using her Aerial Quilt pattern - my block is above. I went ahead and used a Botanics jelly roll - I figured it was a good fit and I love how my block turned out. This was the first paper piecing I've ever done and it makes so much more sense now after seeing someone do it. 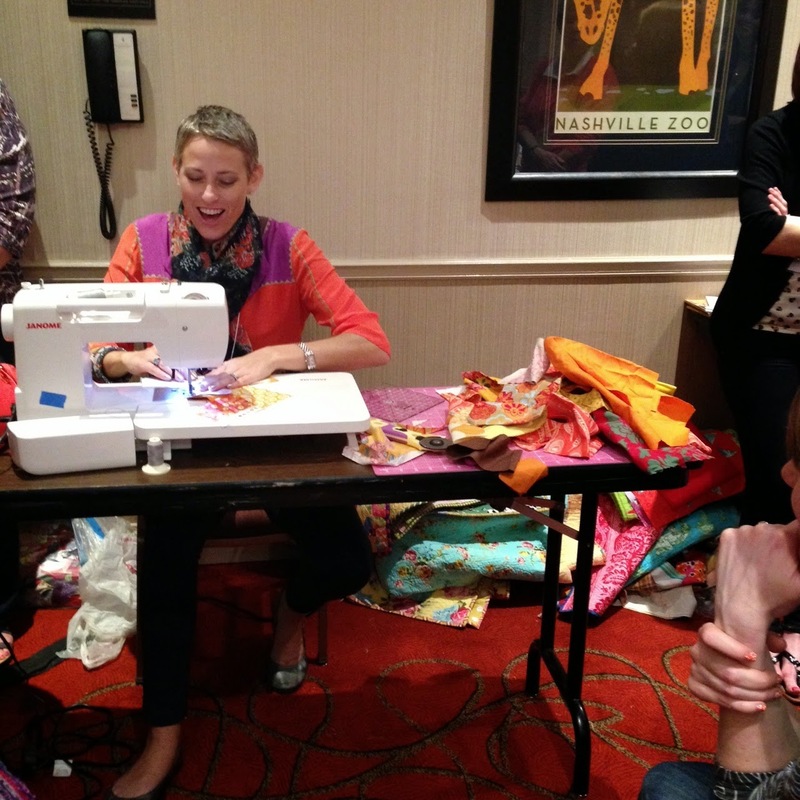 Finally the amazing Angela Walters taught free motion quilting and this was the class I was nervous about - I am not a free motion quilter. Like not at all. BUT she is a wonderful teacher and so amazing at what she does that I thoroughly enjoyed the class and really came away feeling like if I practice I'll actually be able to do it. I'd call that success. Finally check out all these goodies! So many lovely sponsors contributed and I think everyone really appreciated their generosity - I know I did. I could go on and on but I'm trying not to bore you to tears - there are MANY more excellent photos on IG under the #sewdown. It was an experience that completely exceeded my expectations, and I'm old enough to realize how rare and special that is. My roommate was wonderful, I got to meet bloggy and IG "friends" that I feel like I can now just call friends which is wonderful. 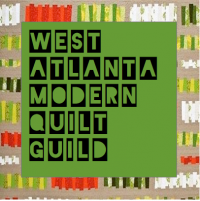 It was a talented group participating and organizing and I can't thank The Modern Quilt Guild and in particular Elizabeth Dackson and Jen Carlton-Bailey for their hard work and friendliness - they made it such a special weekend. 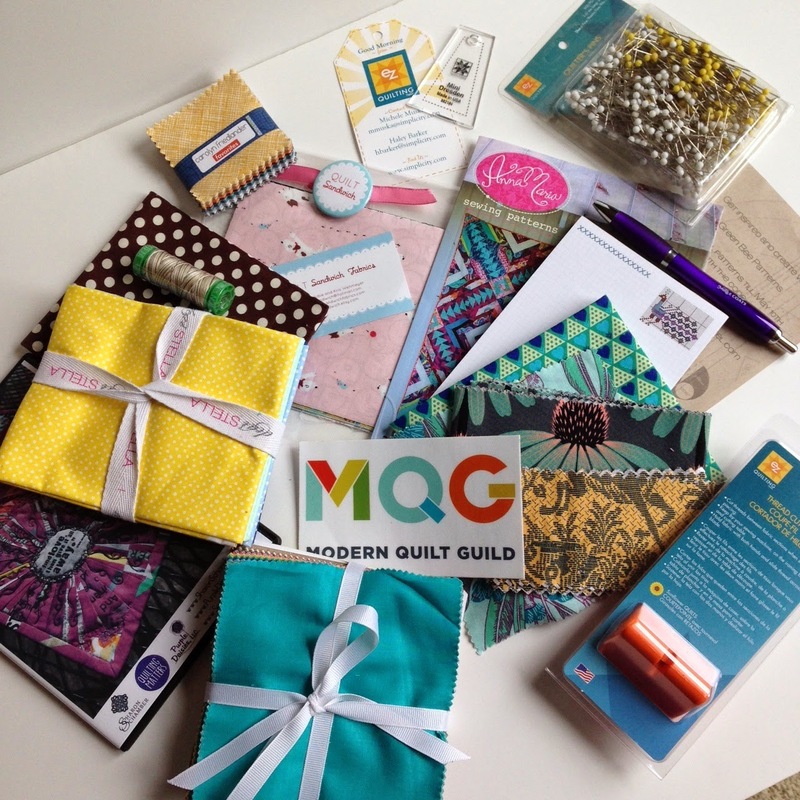 It makes me get VERY excited to see what these amazing people put together for QuiltCon next year! 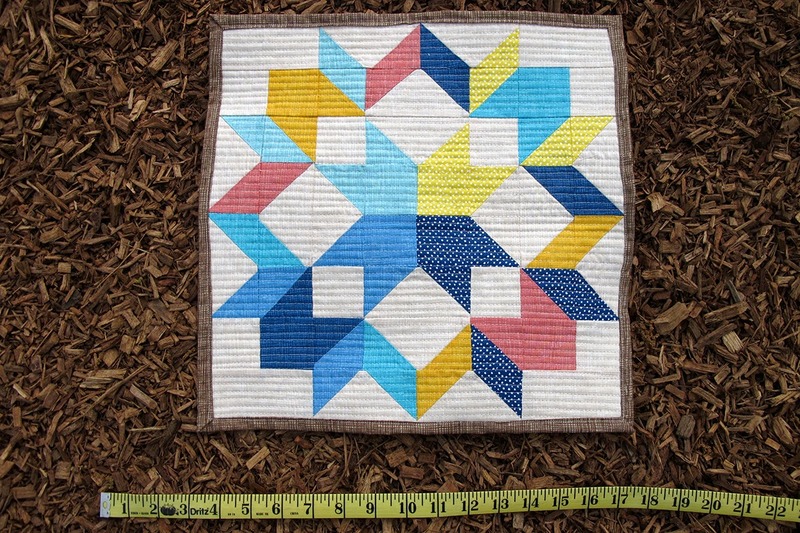 And now I'm trying to get back into the swing of regular life - an update on my triangle QAL later this week and maybe, maybe even a finish on Friday ;-) Hope your week is of to a good start - thanks for stopping by. 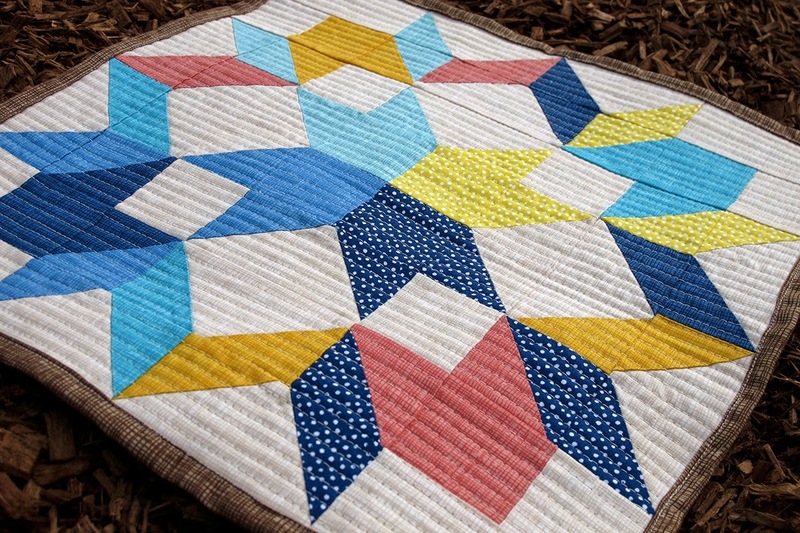 So I'm sure many of you have seen Maureen Cracknell's gorgeous QAYG Herringbone quilts, right? If not go check them out on her blog. I've been super curious about how the block would feel when you join the bulk of the batting in the seams so I decided to make a little mug rug this way as a trial. I cut 4 pieces of batting each 3.5" x 4.5" and then marked my angle on each piece. Then I added my strings just like you would for a regular string block and trimmed off my over hang. 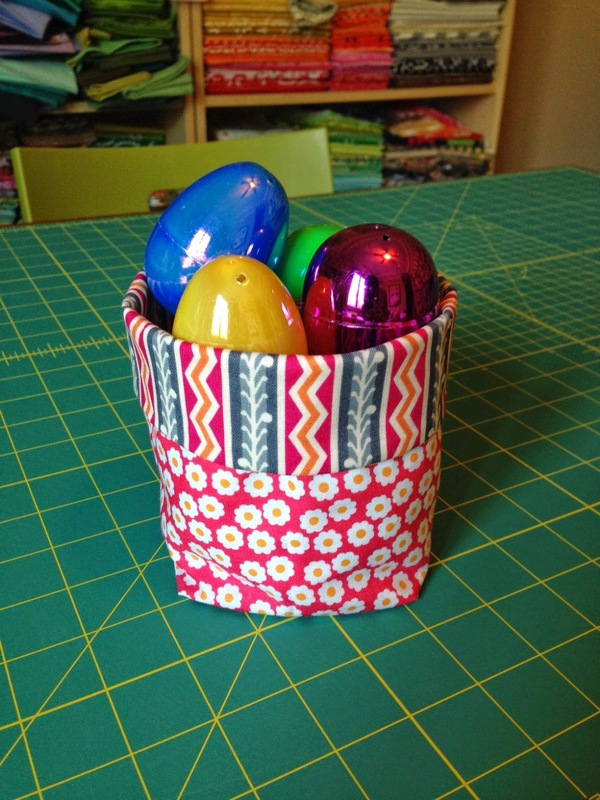 You can find Maureen's full tutorial here, which is what I did on a small scale. Maureen used long rectangles and I was actually curious about using smaller blocks so it could be easier to work on in small chunks, so I used 4 blocks instead of just 2 long rectangles. So I joined my blocks and used Cluck, Cluck, Sew's self binding technique (which I am in love with now for small projects). I only quilted it along the seams as you can see in the photo above. There is a noticeable ridge along where the seams were joined as I suspected there would be from the bulk of having the batting in the seams. 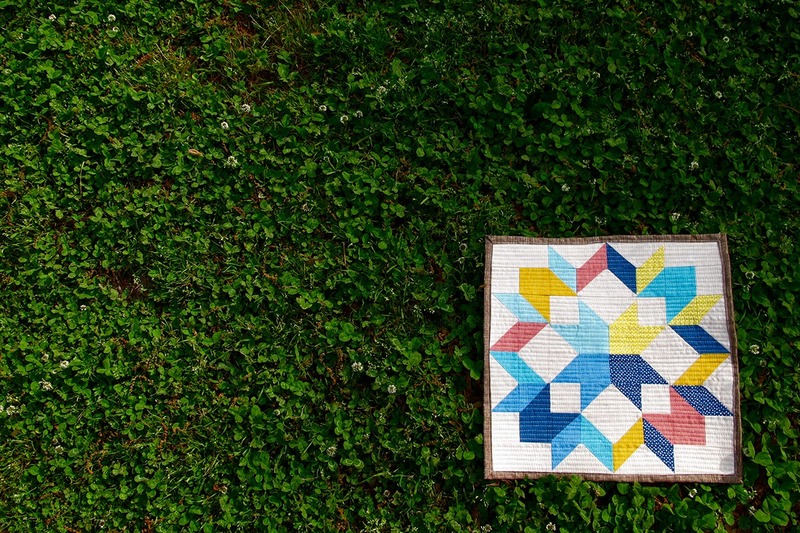 I think it's a completely personal decision whether the bulk bothers you enough to not want to use this method - to me it's noticeable enough that I'm not sure I want a quilt done this way. The biggest knot comes from where all 4 corners meet and if you were using only rectangles that would be avoided. You guys! I feel so ahead of the curve this week! I got my triangles sewn into rows over the weekend so here it it only Tuesday and I'm already linking up with the Sassy Quilter. So far, so good! Other than my cover turning into a 24" pillow instead of an 18" pillow (evidence of my mad math skills) this has been a completely painless experience. 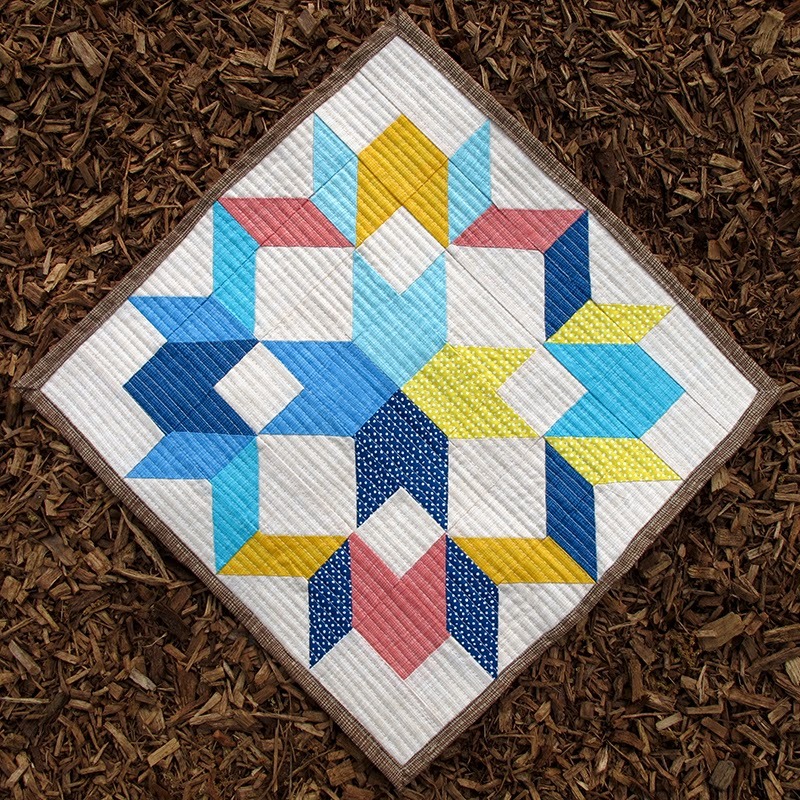 I'm very appreciative of all the tutorials and great tips that the Sassy Quilter has shared - if you're feeling triangle anxiety like I was I'd encourage you to join in and conquer those fears! I spent a little time yesterday cutting my triangles for the quilt-a-long and I was pleasantly surprised at how quickly it went! I had 9 fat quarters and I cut 2 4"x22" strips - my goal is to start small with a pillow cover (or two) before I jump into a quilt. 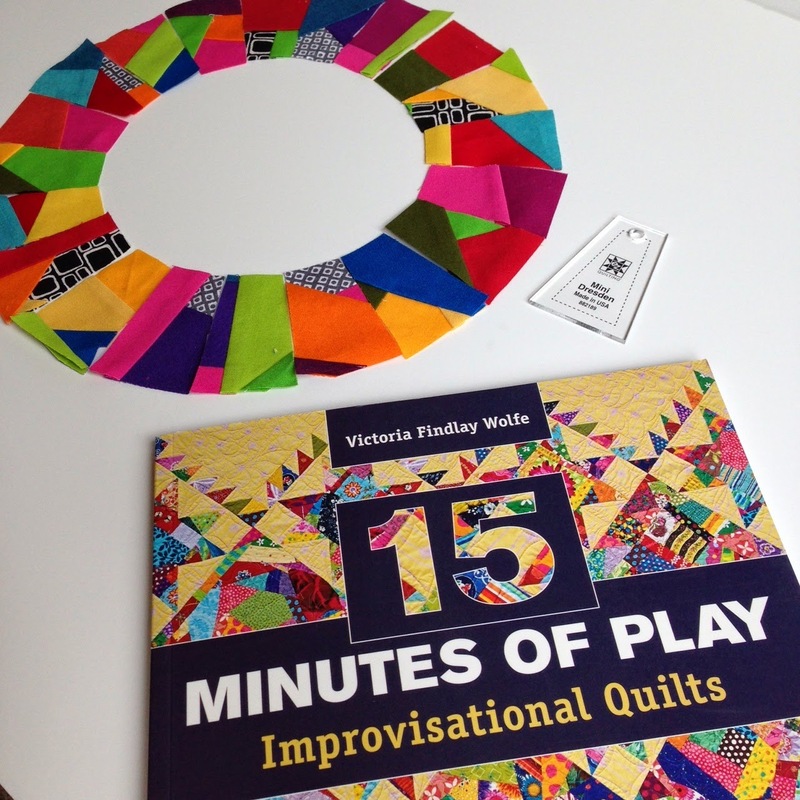 I read both tutorials on the Sassy Quilter blog and decided to use a triangle ruler which made it super easy - I love having the right tool for the job. I know the 60 degree ruler is an investment but honestly if you plan on making more triangle anythings you'll love it (I do anyway). 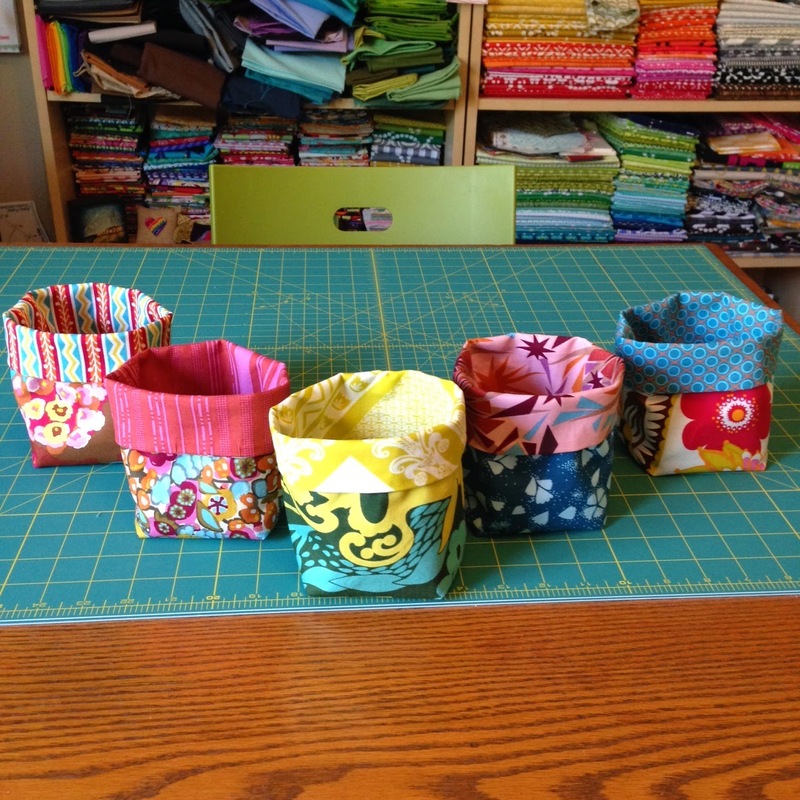 After cutting all my solids I debated whether to add a couple prints into the mix. I put the question to my IG friends. This is a Japanese Cocoland print that I bought at Pink Castle Fabrics. I think this print is sold out but search kawaii or Japanese and you'll find tons of adorable stuff Brenda has in stock. Love the cute, spring-ness of these kitties! And everyone on IG did too - it was a pretty unanimous vote, which made my choice easy. One more 4" strip sub-cut into triangles and I'm done! Looking forward to sewing these little cuties together next week. 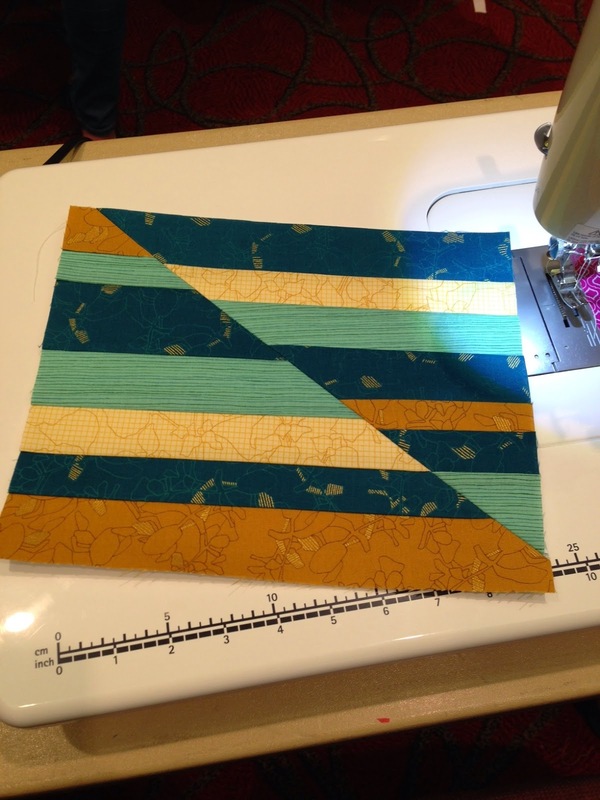 Linking up with the Sassy Quilter for the Triangle QAL.